Note: This is the outdated 2006 version of the Pukerua Bay Village Plan; see instead the current 2011 plan. This Village Plan Overview was produced by the Pukerua Bay Residents’ Association with the involvement of the community of Pukerua Bay. Over the past two years, several public meetings were held, consultations took place and in 2006 a community survey was undertaken in order to receive a clear indication of what is important to the residents of this community and what they would like to see happen in our community in the future. The survey results gave the Residents’ Association the framework for this Overview. The Village Plan Overview is a living document and intended to be kept up-to-date over the coming years. — The Pukerua Bay Residents’ Association. Pukerua Bay is a community rich in families and children. It has a unique village character, being a small semi-rural community at a seaside location, where most people know each other. The settlement history of the locality extends over hundreds of years, as evidenced by numerous Maori historic sites, with the continued relationship with Ngati Toa, and European settlement beginning with a few farms established in the late nineteenth century. Pukerua Bay now has a stable population of approximately 1,700 people. Though physically divided into east and west by State Highway 1, the community forms a united front when it comes to preserving the marine environment and the iconic landscape and feel of Pukerua Bay, which has inspired writers, artists and movie directors. Considering our size, we have many clubs and organisations, ranging from Folk Music, Civil Defence, Tennis Club, Cubs, Scouts, Pukerua Bay Soccer to Playgroup, Pre-School, and Plunket rooms. We are fortunate to have two train stations, Muri Station to the north and Pukerua Bay Station to the south. As a result, those people who work in Porirua or Wellington are able to commute by train as an alternative to travelling by car along a very congested State Highway 1. Recently, within the village, a “walking school bus” scheme was put into action in 2006. This is an example of effective and valued cooperation between the school, parents, and Porirua City Council working together to improve the safety of our children and other pedestrians. What attracts people to living in Pukerua Bay? According to the 2006 Village Plan Survey results, Pukerua Bay’s residents put a high value on retaining the character of Pukerua Bay as a small seaside community by expressing a strong objection to more housing developments. The prioritisation part of the survey also identified protecting our beach and marine environment and providing for safe walking and cycling as the highest priorities, followed by “A natural environment”, “Enjoying a quiet peaceful life”, and “A place to raise children”. 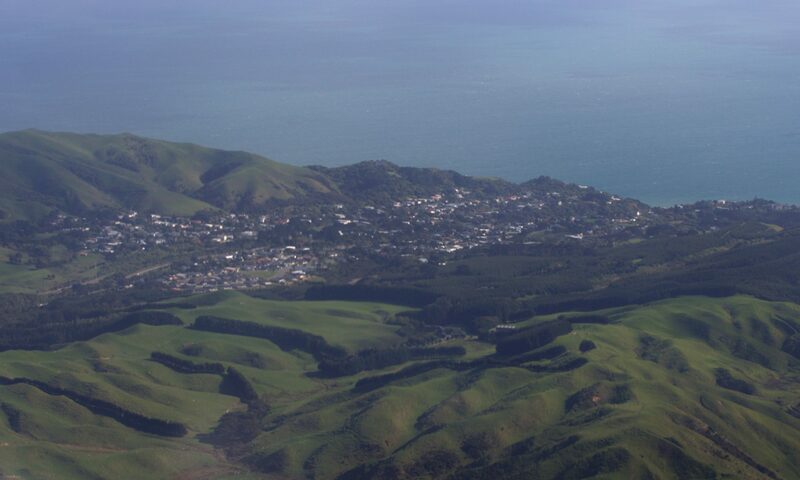 Pukerua Bay is endowed with a high degree of vegetation throughout the residential areas and enjoys an undisturbed rural outlook to the surrounding hills. The beaches and coast, unspoiled by development, also contribute to the natural environment residents of our community value so highly. These qualities need to be preserved in all planning, considering aspects such as visual pollution. In general, our community is well aware of environmental concerns, in particular, by consequence, the impact of road traffic. State Highway 1 is likely to keep going through Pukerua Bay for many more years, therefore it is prudent to counter its effect by improving walking and cycling facilities, in particular concerning State Highway 1 crossings. Lastly, the survey results reinforce the view that Pukerua Bay is a great place to raise children, precisely because of the natural environment, rural character, ease of access to the beach and outstanding marine environment. All of these features must be protected and enhanced, while at the same time action is required to address residents’ concerns regarding State Highway 1, safe walking and cycling, further protection and recognition of our natural environment and the interrelationship of all these elements. Community of choice for residents and families seeking a friendly, small village in a peaceful, unspoiled natural setting, supported by good local infrastructure and facilities. The remainder of this document presents an itemised action plan for working towards this vision with objectives supporting the goals stated in it. Continue to work directly with Ngati Toa to have the Temporary Closure reinstated. This could be for a fixed term of 2 x 2 years. However, there can be no guarantees for gaining approval for a second 2 year term as this would be at the Minister’s discretion. Explore several promising long term strategies for Pukerua Bay marine protection. Our overall objective remains constant, to work closely with Ngati Toa to provide long term, legally robust marine protection for the shallow reefs at Pukerua Bay. Pukerua Bay will be subject to increasing traffic volumes along State Highway 1 for the foreseeable future. Transit New Zealand estimates (2006) indicate current traffic volumes of 22,000 vehicles per day may increase to 32,000 vehicles per day over the next ten years, at which time Transmission Gully is projected to be constructed. To increase the safety of all travellers, modifications are required to ease congestion and reduce the hazards at intersections of State Highway 1 and local streets. Construct pedestrian underpass at Teihana Road. Improve Teihana Road / State Highway 1 intersection. Realign Pukerua Beach Road exit onto State Highway 1 to improve visibility. Improve Wairaka Road / State Highway 1 intersection. Improve Gray Street / State Highway 1 intersection with feeder lanes to the south and a safe stopping area for northbound vehicles turning into Gray Street. Remove 70km/h sign and replace with a 50km/h sign to 100 meters downhill. Extend Ara Harakeke trail from Pukerua Beach Road to Pa Road. Transit New Zealand has committed to the construction of the pedestrian underpass and further traffic safety measures to cope with increasing traffic volumes. These measures will require the participation of residents and the technical advice and support of Porirua City Council to ensure that both through traffic and the local community are well served. Safety on and near State Highway 1 is one of the major concerns of almost every resident and has been the most discussed item in community discussions about the Village Plan. Widen the footpaths and upgrade to a combined footpath/cycle path along State Highway 1. Installing a pedestrian barrier at the bottom of the Haunui Road/State Highway 1 zigzag path to avoid children going onto State Highway 1. Construct a footpath along Muri Road. The footpaths are too narrow along State Highway 1, particularly north of Pukerua Beach Road. There is a great safety concern regarding the Haunui Road/State Highway 1 connecting walkway – it is a steep zigzag path with no barrier at the bottom end (SH1), which makes it a safety hazard for people running or cycling down the path. Muri Road has no continuous footpaths, yet is used by children to walk to school. End of cycle path in front of Charles Gray Homestead. Construct a cycle path connecting the Ara Harakeke walkway with the coastal cycle path along Centennial Highway. There is no continuous cycle path in Pukerua Bay. Cyclists use the footpaths to ride on as the main road is too dangerous. This is part of a cycle path network throughout Porirua City. Overview plan drawing of proposed cycle path. Build an underpass at Teihana Road to allow a safe east/west connection with Pukerua Bay Station. Construct a safe pedestrian crossing option between east/west to Muri Station. A pedestrian island has been put in place, however it needs to be properly aligned which would require some work moving the pedestrian island further south and cutting into the embankment on the west side to allow for better visibility and safety while crossing. Increase safety in the vicinity of the Kindergarten on Wairaka Road – possibilities include traffic calming measures. There is no pedestrian crossing on the route between the shops and Pukerua Bay train station. School children and train commuters have to find a gap in the traffic flow to be able to cross. The section of State Highway 1 near Muri Station is used by train commuters from the northwest area of Pukerua Bay. Wairaka Road is home to Kindergarten, Plunket and pre-school and consequently this road is crossed with a high frequency by parents with toddlers and young children. Pukerua Bay Kindergarten, Wairaka Road. Pedestrians crossing Wairaka Road cannot be seen by motorists turning off State Highway 1 into this road. Almost all motor vehicles travel at or above the speed limit coming down the hill slope of State Highway 1. This speed does not provide adequate braking distance when turning into Wairaka Road and also makes it difficult for people attempting to turn into Wairaka Road coming from north to find a gap (no turning bay). Upgrade and expand the skate park to allow for multifunctional use, including bicycles, scooters, rollerblades, and skateboards. The existing skate park does not meet the AS/NZ standards for skate parks and is only catering for skateboarders. It is dangerous due to an uneven, deteriorating surface and is located in a secluded area. The expansion of the skate park, by removing the neighbouring children’s playground, will improve safety and visibility. Install additional lighting and pruning of some trees will make the location less secluded and improve security. The local school and tennis courts are presently being damaged by grinds (sliding the board along objects). The proximity of the skate park to the train station results in youths congregating there to drink and socialise. As a result, the area often contains broken bottles, litter, and graffiti. Consequently, some young people and parents regard this as an unsafe area, which leads to its underutilisation. A well re-designed skate park could benefit in excess of 100 local young people as well as others around the region because of ease of access via train. Remove existing playground and develop an alternative to the playground at the train station. Establish a playground at the new St. Mary’s Estate suitable for toddlers and young children. The current location of this playground is close to the railway tracks and is a safety concern for parents with young children. The equipment is old and not suitable for toddlers and young children (sharp metal edges of steps). The eastern area of Pukerua Bay is expanding and the only significant playground facilities are located on the west side of Pukerua Bay, including the adventure playground at the local school. St. Mary’s Estate has the necessary infrastructure (pavements, street lighting) and is located in a high profile reserve area which would deter vandalism. Playground in front of skate park. Introduce a mountain bike trail behind Muri Reserve. Provide a good facility often requested by teenagers in Pukerua Bay. This could be a regional resource. Control erosion and overgrown vegetation to maintain a viable access track to the beach. This track, from the end of Rawhiti Road, has been used by many people from the western area of Pukerua Bay to go down to the beach. Current state of the track is unsafe. The track is an old Maori walking track and is a candidate for inclusion in the Gold Trail. Upgrade boat ramp and beacon. Redevelop area at the south end of Ocean Parade. Area at the south end of Ocean Parade has recently been closed to traffic and would be suitable e.g. for picnic tables, interpretation centre. The Gold Trail will cover cultural heritage sites. The preliminary work for this has been an ongoing process over the last three years. Historic buildings such as Charles Gray Homestead will be added to the Heritage and Protected Buildings register. Further sites include Pa Road, Maori burial ground. 37 historic sites have been identified as part of this Gold Trail. Together these sites, commencing at the Taupo Swamp and following a route to north of Pukerua Bay finishing at the memorial along Centennial Highway, provide a record of both Maori and European settlement which residents and visitors would be able to able to explore. The Green Trail will cover ecological sites and notable trees. This Green Trail, like the Gold Trail, will incorporate both Maori and European examples thanks to the support and assistance of Ngati Toa and local Pakeha historians. Involve the community in scheduled reviews of suburban and residential zoning. Insure all district plans are enforced as there are many ecologically and historically significant locations in Pukerua Bay not many are aware of. Improve consultation between the Residents’ Association, the community and Ngati Toa to avoid the decimation of the character and iconic landscape of Pukerua Bay and the surrounding hills. Protect the agricultural landscape and rural character. Constant risk of further land being built on increases traffic conflicts with local vehicular and pedestrian traffic movement onto and across State Highway 1. The subdivision of St. Mary’s Estate is now putting pressure on the Gray Street intersection, which has to be upgraded. Panoramic view of Pukerua Bay. Develop a designated walkway between St. Mary’s Estate, Gray Street and Muri Road. Upgrade path from lookout above Brendan Beach as it is steep and slippery, and is developing cracks in the surface. Install a mail box on the east side of Pukerua Bay. Add street lighting to Haunui Path. The residents of Pukerua Bay who have attended public meetings along the way. Everyone in Pukerua Bay who took the time to fill out the Village Plan Questionnaire. Staff at Porirua City Council for their continued support. Special thank you to Brian Mosen and Rosemary Young. 2006 Village Plan Survey Results.